The Checkered Life: Nice Affordable Cakes for All! Nice Affordable Cakes for All! 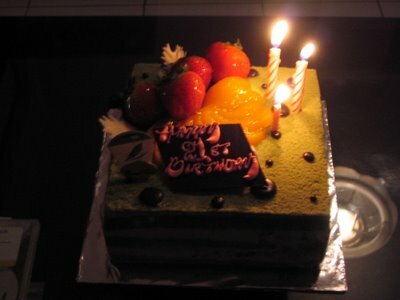 First up, is the cake i had for my 21st bday! "Fruit field" from Bread Talk! I don't remember what was the desrciption for this cake... its a long & winding story! But watever d story, what matters is the taste!!! Anyways this cake is essentially a soft sponge cake with cream layers in between... as the name suggests, its green cuz it's a green tea cake! YuMMy! I have tried green tea cakes before but most have been bitterly dissapointing! Literally! However, this one stands out cuz its delicious! The cream, deliciously lucious looking fruits & chocolate drops compensate the bitterness of green tea! Superb & delicate combination! Aside from that the price is quite affordable! Around RM50++.... i give it a 4 thumbs up out of 5. 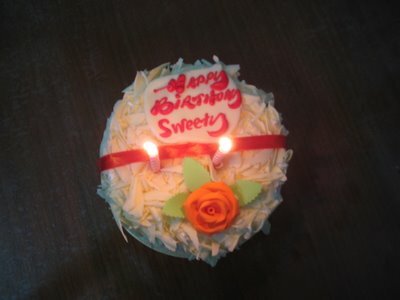 This cake is from Berry's.... One of the most affordable around, you could get it at RM40++. Whats nice bout this cake is the presentation. Looking at it you would think that it was snowing in the oven while being baked!! :P Although its nice to look at, the downside of this cake is that it might be a tad sweet for some folks out there. I give it a 3 out of 5 and recommend it for those looking for something sweet & white! haha... how come no cheeese cake de? ?